The Zelda timeline has long been a matter of dispute among fans, but after the release of Hyrule Historia, they finally have an official ordering of the games in the series. After the release of Breath of the Wild, that’s all in dispute, again. Warning: The following article contains story spoilers from Zelda: Breath of the Wild. The only official word from Nintendo on where Breath of the Wild takes place in the timeline is that it’s after Ocarina of Time, as confirmed in a Game Informer interview with series creator Shigeru Miyamoto and producer Eiji Aonuma. That’s not much help to fans, as most games in the official timeline take place after that game. According to Hyrule Historia, an art book which was penned in part by Aonuma, the time travel in Ocarina of Time, where Link went back in time to warn Zelda about Ganon, caused a split in the timeline. One such split lead to the universe where Ganon comes back and is unopposed, as Link went back in time, and created the universe where Wind Waker exists. The universe where Zelda is warned about Ganon by a time traveling Link accounts for Majora’s Mask, Twilight Princess and Four Swords Adventures. There’s also a third timeline, one where Link falls to Ganon, which eventually leads to the original Legend of Zelda games. 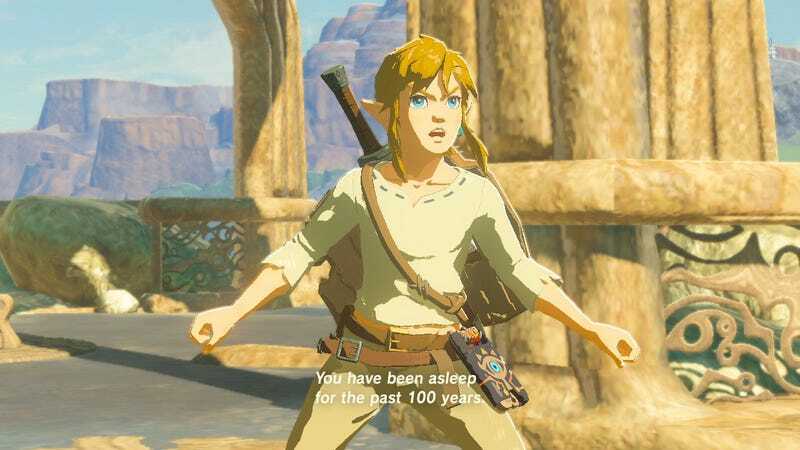 Given the plot of Breath of the Wild—Ganon was defeated by the Divine Beasts 10,000 years ago, and then fought again 100 years ago—most fans feel like the game must exist in the far future of one of these three timelines. But which one? There’s sound evidence for the Wind Waker timeline. Breath of the Wild has Koroks, woodland sprites that had only appeared in Wind Waker previously. The human-bird hybrid race, the Rito, were also only in Wind Waker, although they look very different in Breath of the Wild. Players can also use an item called Rock Salt in their cooking, and the item description says it is, “crystallized rock from the ancient sea.” The world of Wind Waker was covered by an expansive ocean—who’s to say that ocean hasn’t receded in the intervening years? But some other fans feel like the game presents contradicting evidence for that theory. In particular, you can visit the Temple of Time in the Great Plateau, which is a landmark that appears in older Zelda games. The Wind Waker timeline concludes with the founding of a new Hyrule, in a land distinctly different from the old Hyrule. Furthermore, when you talk to Impa in Kakariko Village, she tells you that the history of Hyrule is also the history of the Calamity Ganon, who attacked Hyrule multiple times. Aounuma has repeatedly said that this is a hint as to where Breath of the Wild appears on the timeline. As YouTuber HMK points out in his video theorizing where Breath of the Wild fits in the timeline, the Wind Waker universe was only attacked by Ganon twice: once during Ocarina of Time, and again during the events of Wind Waker. Ganon doesn’t make an appearance in the games set in New Hyrule. Ganon is more closely tied to other two timelines, where he makes repeat appearances. Some fans think a line of dialogue from one of Link’s lost memories, where he is knighted by Princess Zelda as the Hero of Hyrule, is the key to discovering which one. She says, “Whether skyward bound, adrift in time, or steeped in the glowing embers of twilight…” apparently referencing Skyward Sword, Ocarina of Time, and Twilight Princess. Skyward Sword is the origin story of Hyrule, and Ocarina of Time is where the timeline splits, but Twilight Princess takes place after that split, in the timeline where Link goes back to childhood to warn Zelda about Ganon. Some fans insist that there’s also enough evidence to place Breath of the Wild in the timeline where Link falls to Ganon, however. Ganon also attacks Hyrule multiple times in the timeline where Link falls to him, but the biggest piece of evidence that fans have for this timeline is the location of the Master Sword. In the other two timelines, the Master Sword is left in very specific places. In Wind Waker, it’s at the bottom of the ocean, stuck in Ganon’s head, and in Twilight Princess it’s in the ruins of the Temple of Time. The Temple of Time is in the Great Plateau in Breath of the Wild, and the Master Sword is in the Lost Woods. As Calamity Ganon is currently ravaging Hyrule Castle, clearly it’s not in his head. In Breath of the Wild, the Master Sword is in a grove in the Lost Woods, at the same exact location it’s found in The Legend of Zelda and The Adventure of Link. YouTuber Zeltic points out that the flowers that surround the Master Sword are also in the same location as those games, implying that it’s the same grove. Each timeline placement theory has strong evidence, but also enough has now been discovered in game that contradicts these theories. Personally, I’d love for this to be the far future of the Wind Waker universe, as that game is my favorite in the series. But Breath of the Wild is a huge game—as time goes on, fans may find new evidence that weighs one timeline over the others. Or maybe they’ll just be holding out hope until Nintendo drops another hint.